2015 AAC&U Summer Institute on Integrated Learning Strategy Team. In 2015, Our Faculty Strategy Team attended our first AAC&U Summer Institute focused on Integrated Learning and the Departments held at the University of Delaware. The focus was on enhancing integrative learning rather than developing the technology which is secondary. An important lesson learned during our exploration of e-Portfolios and especially the variety of platforms available for developing e-Portfolios was that the focus should be on enhancing students integrative learning instead. Thus, we abandoned the search for the “perfect” software and encouraged faculty and academic programs to choose a platform that best meets their needs. Now our focus is on students: (1) building and curating repositories of their academic and co-curricular work; and (2) building those repositories into e-Portfolios as they are tasked to reflect upon their work and take ownership of their own learning. Our success will be judged both by the number of new academic programs that decide to explore and adopt e-Portfolios and the improvement in integrative learning as measured by the Integrative Learning VALUE Rubric. In 2016, our Faculty Strategy Team attended AAC&U Summer Institute on Integrative Learning and the Departments to report on 2015 action plan results and to fine tune and scale-up e-Portfolio and high impact practice efforts. Implementation efforts revealed that a broader focus on high impact practices would be more appropriate to grow, support, and sustain an institution-wide initiative that would include interconnected high impact practices that includes e-Portfolio as a super-high impact practice. During the Fall 2015, ODU leadership created the Center for High Impact Practices (CHIP). The Center for High Impact Practices supports the growth, development and enhancement of educational practices to improve student learning in the classroom through instructional programs, resources, services and assessment that introduce and promote college-level learning from first-year through graduation. 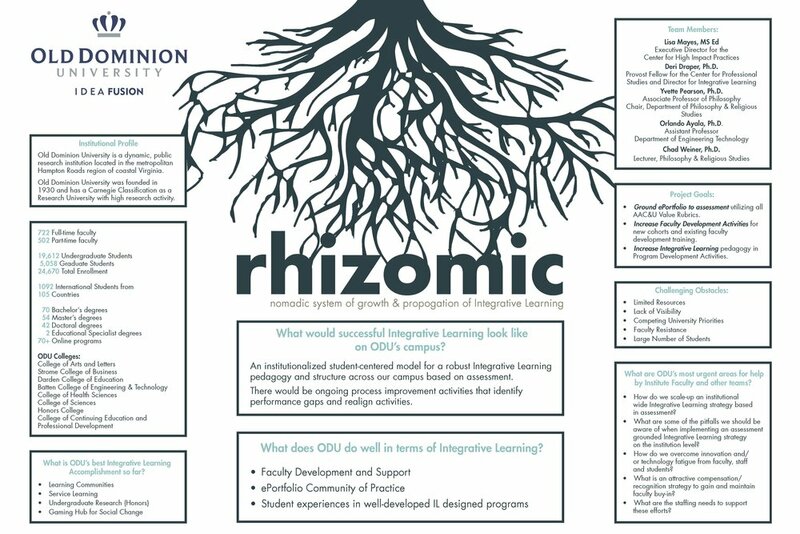 The purpose of the CHIP is to coordinate the implementation, assessment, and expansion of high impact practices (HIP) at Old Dominion University and is a student-centered approach to supporting student learning and college success. In December 2016, our dedicated and talented faculty attended an Integrated Learning/Beyond eP3 Workshop that culminated in a Faculty e-Portfolio Showcase. The e-Learning module below is an example of content from an Integrated Learning Course.